It follows Seoul's announcement on Sunday that it would almost triple the range of its own missile system. Pyongyang is thought to be working on a long-range missile, but two recent rocket tests ended in failure. North Korea's neighbours said the failed rocket launches - in April 2009 and April 2012 - were tests related to the development of the long-range Taepodong-2 missile system. The system, which analysts believe is intended to put the US mainland within striking range, has not yet been tested successfully. Experts and intelligence assessments differ as to the scale and scope of North Korea's missile capabilities. Inevitably the programme is shrouded in secrecy. Earlier this year a failed attempt by the North Koreans to launch a satellite into orbit was seen as a set-back for their long-range missile plans. The technologies for long-range missiles and the rockets needed to boost a satellite into orbit are similar. But last April North Korea revealed what it claimed were six road-mobile intercontinental missiles at a parade in Pyongyang. Since then a debate has raged among Western experts: Were they fakes? The real thing? Or were they "real fakes" - in other words true indications of where North Korea's technology is heading? One way or another, North Korea is not far away from having an intercontinental missile - it is only a matter of time. 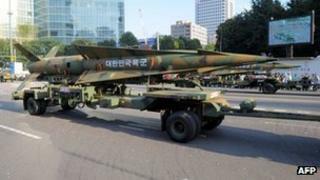 But the Communist state does possess an array of short- and medium-range missiles, as well as artillery pointed towards South Korea, says the BBC's Kevin Kim in Seoul. It added that the missile deal between the US and South Korea was "another conspiracy of the master and the stooge to push the situation on the Korean Peninsula to the extreme... and ignite a war". Under a previous security deal with the US, it had been restricted to missiles with a range of 300km (186 miles). The new deal extends that range to 800km. National Security Adviser Chun Yung-woo said the aim was to curb "military provocations by North Korea". The two Koreas remain technically at war following the 1950-53 Korean War, which ended in an armistice. The US has more than 28,000 troops in South Korea and provides security guarantees for its ally. The Taepodong-2 - or Paektusan-2 - is a two to three-stage ballistic missile, but is a significant advance on the Taepodong-1. Its range has been estimated at anything between 5,000-15,000km. The Center for Nonproliferation Studies puts the figure at a maximum estimated 6,000km. Taepodong-2-linked technology has been flight-tested three times, in 2006, 2009 and 2012. It failed to perform on each occasion. In the early morning of 5 July 2006 (still 4 July in the US), it flew only 42 seconds before exploding - according to US sources. A three-stage space launcher version of the Taepodong-2 was then used in a failed attempt to send a satellite into space in April 2009. The launch was widely condemned by the US and South Korea, among others, as cover for a long-range missile test. A similar launch took place in April 2012, but the rocket broke up after a few minutes and crashed into the sea.